The news has been buzzing with Sony's latest rollable OLED screen (note: Sony does not specify that it uses this particular technology in its organic thin-film transisters product). It's an impressive sight, but how does it work? 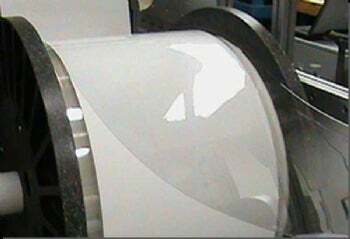 Corning has been developing flexible substrates on which electronics can be printed. Amazingly, Corning's latest substrate is made from very pure glass (and it doesn't shatter!). According to Carl Taussig, director of the Information Surfaces Lab at Hewlett-Packard Labs in Palo Alto, California, "Glass is a great surface for building thin-film devices on." Water can't seep into glass unlike its plastic counterparts due to glass's impermeability -- meaning that the electronics can last longer. Glass is also smoother and can therefore accommodate the building of perfectly structured electronics. Finally, glass can survive higher temperatures than plastics, meaning the electronics can be made at higher temperatures which results in faster switching electronics, producing a crisper display. One added benefit is their low weight. The glass can be coated or treated for specific traits, meaning a more resistant surface and just as strong as current thicker displays. The impressive glass is only 75 micrometers thick. The glass also means less material waste on thicker screens, and more energy efficient than Liquid Crystal Displays (LCDs). The flexible displays can be used for a variety of products from solar cells to thin film displays. Perhaps you have seen Harry Potter read The Daily Prophet, an animated newspaper that comes to life as you read it. This might be a chance for developers to bring a Prophet-like newspaper to your hands. It could even periodically update as new stories are developed. The thin film displays could also be used in your eyeglasses so you don't have to bring an extra screen with you. Corning has sent the glass to certain companies to test it with building products. The thin film glass may soon be used in products ranging from your 52-inch monitor to your "ultrathin no thicker than a newspaper e-reader."